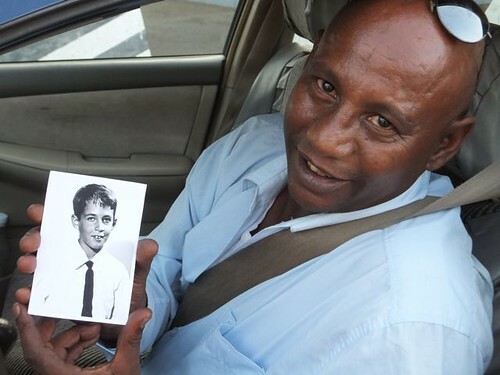 When I visited Asmara, Eritrea recently after many years away, I carried a small black and white photograph of myself taken at the age of ten, writes Steven McCarthy in his third report from Eritrea. 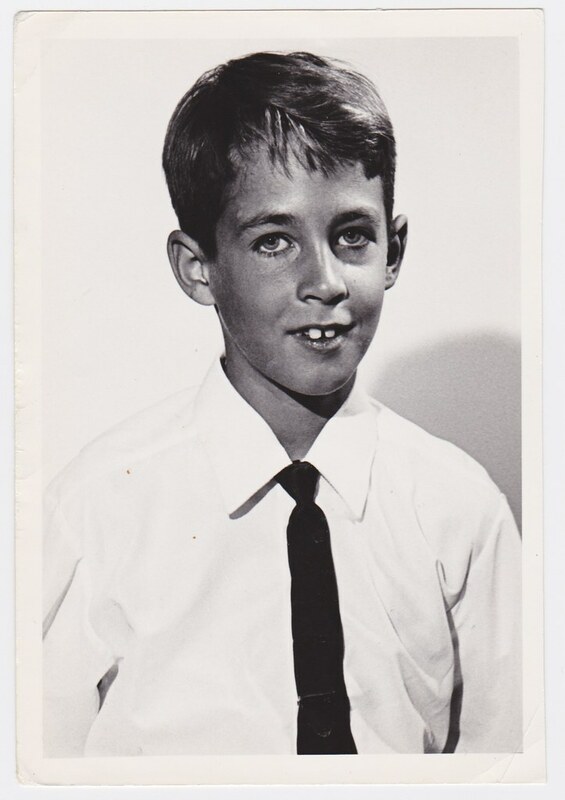 The picture, taken in 1968, the second of two years that my family spent living there, shows me with a suntan that’s indicative of east Africa’s high plateau geography and hot, dry climate – offset by a white shirt. Eventually, I grew into my prominent two front teeth, but alas, I no longer have the head of dark hair. 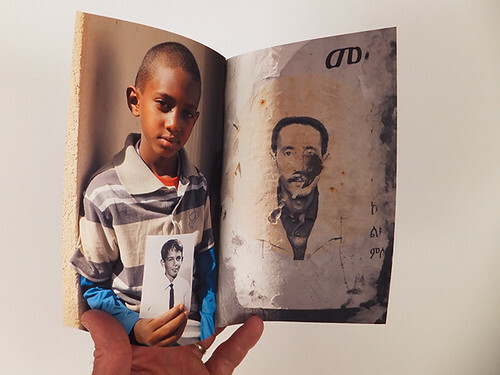 An Asmarino holds a picture of Steven McCarthy (also shown at top) taken in Eritrea in 1968 when McCarthy was ten. I asked the Asmarinos I met to pose with the picture as a commentary on several things. For starters, it was an easy icebreaker: I described my time there as a child while the photo showed how I looked at that age, often to their amusement. 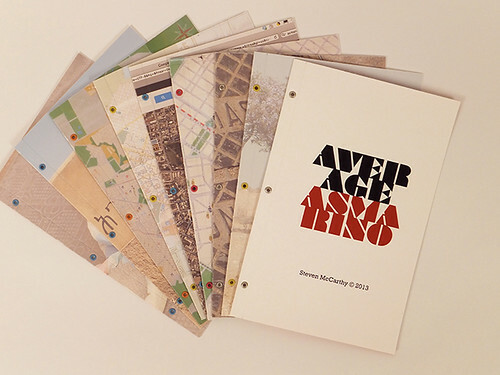 Spreads from Average Asmarino by Steven McCarthy. Top: Steven McCarthy photographed in Asmara in 1968. The juxtaposition symbolises issues of migration, geography, colonialism, imperialism, memory and identity, topics addressed in my earlier essays ‘Pride and posters in Eritrea’ and ‘Mapping Asmara’. 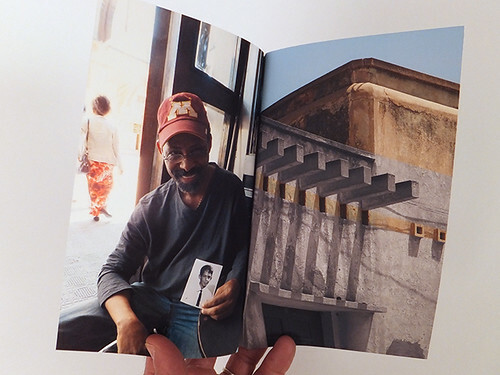 Spread from Average Asmarino by Steven McCarthy. Photography theorists may debate concepts about ‘the gaze’, object versus subject, documentation versus manipulation, art versus art direction and so on. My intention was to create a visual dialog between then and now, here and there, us and them – all positions open to interpretation and flux. 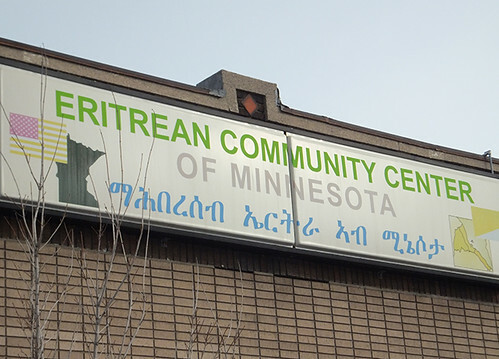 As many Eritrean immigrants who have settled in my home state of Minnesota are aware, reality doesn’t always match the postcard. A glimpse of Eritrean immigration pictured in Average Aspmarino. My artist’s book-in-progress Average Asmarino is a graphic design response to my trip. 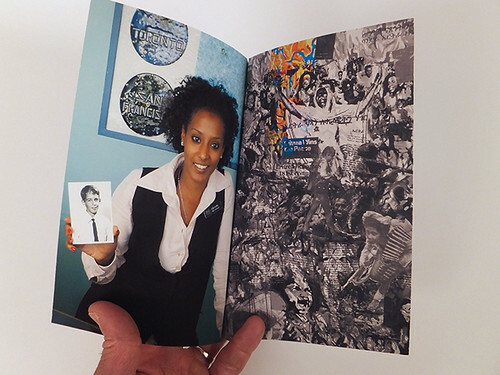 The colour photographs of people holding my picture are paired in folios with contrasting images: colour is stripped out, except in selected areas. They aim to express something about the way the shifting boundaries of memory and identity – often age and experience-dependent over time and place – confound visual perception. 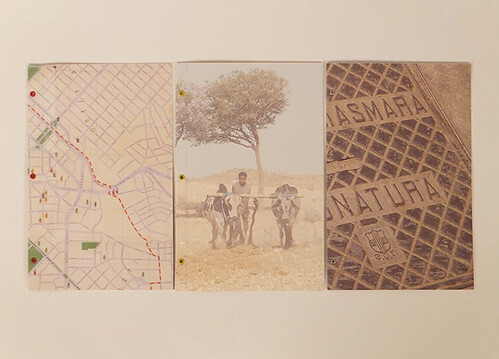 On the outside of the folios are lightly tinted images of maps, landscapes and close-ups of items on the ground. While maps have geo-political roles emphasising scale, a Municipio di Asmara Fognatura (city sewage) cover or a vendor’s basket of teff grain on a coveted street corner are examples of mapping at the micro level. Maps as they appear on the folios of Average Asmarino.